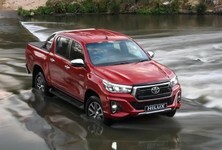 The new Toyota Hilux is a significantly more refined product than its predecessor, which demonstrates the brand's determination to be an even stronger player in the leisure double-cab segment. For comfort- and refinement-oriented shoppers, the allure of an excellent automatic derivative is difficult to ignore: is the Hilux flagship in the running for best-in-class honours? For more space: The Ford Ranger 3.2 XLT is similarly priced and specced, but offers more cabin space than the Toyota. Its ride quality is also superior on most surfaces. If you can stretch your budget by an exta R30k-odd, then the popular Wildtrak version is worth considering, as it adds some very attractive extras. For a more car-like drive: The Volkswagen Amarok, when fitted with the slick 8-speed automatic transmission, feels more like a normal passenger vehicle, and less like a bakkie. Want an automatic, but want to spend much less? If you're willing to sacrifice some power, Ford's new 2.2-litre Rangers are now available with a self-shifting 'box. Worth considering if you're not going to be towing much. Modern fascia design and upmarket finishes lift cabin ambience significantly. Why are double cabs so popular? It's quite simple, really... These vehicles are very commonly used not only for long road journeys to family holiday destinations but for daily runs to the school, shops and office, as well as shorter weekend trips. It is in these urban environments and in traffic where (manual) double cabs can feel cumbersome/hard to drive. An automatic transmission results in a far more relaxed drive. 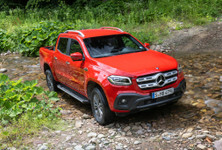 Now add the benefit of significantly easier off-roading, as well as a smoother overall drive on those previously mentioned long holiday trips, and the appeal is not difficult to understand. Now add Toyota's new six-speed automatic transmission and the picture is even rosier. The transmission is quite advanced and features "control logic" that is claimed to be able to decide (in real time) whether a higher gear should be selected to boost efficiency. It also boasts Deceleration Downshift Control that is said to optimise downshifts when slowing down to further boost efficiency. The system shuts off the fuel supply and downshifts automatically to promote engine braking. So, it's quite a clever transmission that doesn't often seem to "hunt" for the correct gear. Combined with its smooth-shifting characteristics, the transmission further enhances the already impressive sense of refinement that the new Hilux exudes. Floating touch-screen info-tainment interface is standard, and somewhat fiddly to use. Shoppers spending almost R600 000 on a leisure bakkie demand significantly more than just leather upholstery and a couple of car-like features. These vehicles have become not only luxurious lifestyle vehicles, but status symbols that need to offer the latest in design and technology. 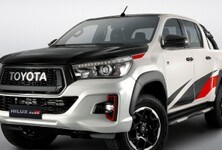 In these aspects, Toyota has done a commendable job with the latest Hilux. 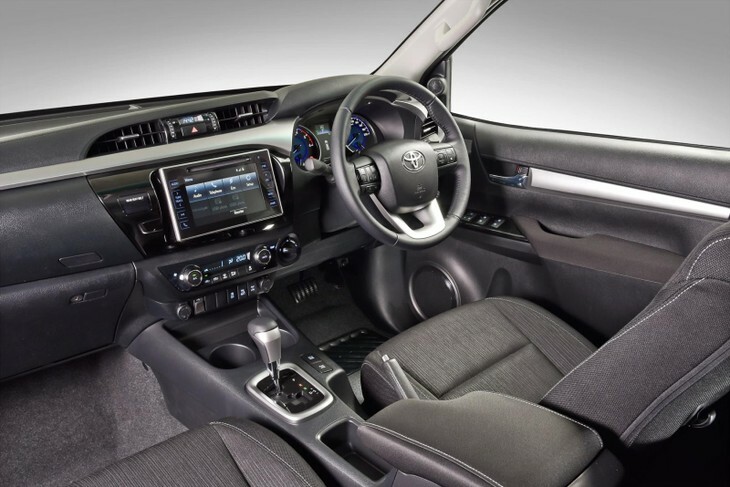 While the Hilux's exterior design has its detractors, its far more difficult to criticise the modern, feature-laden interior. The neat instrumentation with its Lexus-like TFT multi-info driver display elevates the Hilux to a more "premium" position. 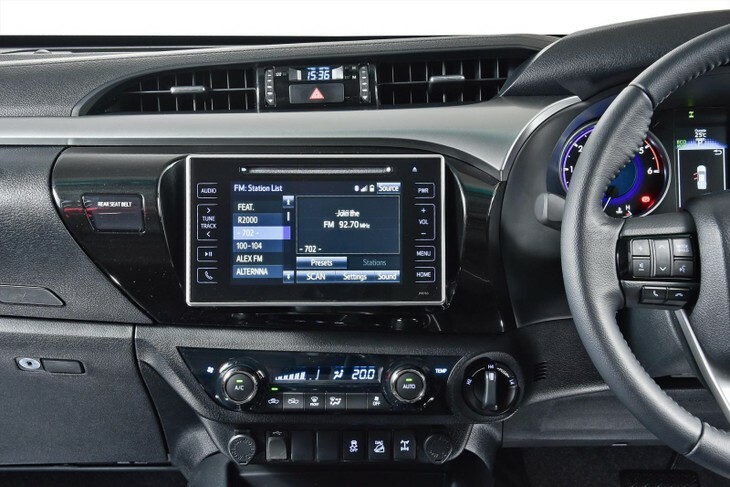 There's also a "floating" tablet-like touchscreen interface for the infotainment system and the general fit and finish of the cabin is (now) arguably class leading. Perhaps the one missing feature (given the price and more upmarket ambience) is leather upholstery. The latter is an optional extra. Note that the Ford Ranger 3.2 XLT, which is similarly priced to the Hilux, offers leather upholstery as standard. Rear legroom is comparatively limited and the seating position upright compared with the Ford Ranger. We also appreciated the rake/reach adjustable steering wheel which, together with the superb front seats boosts driver comfort significantly. The picture is less rosy at the rear, however. While there appears to be more space than in its predecessor, the improvement is marginal – Toyota claims 10 mm more rear legroom. Compared with a vehicle such as the Ford Ranger (and even the soon-to-be-facelifted Isuzu KB), the Hilux's rear passengers still have to make do with less pace and the seating position is more upright. The cabin is, however, well stocked with practical touches. The double glove compartment is a nice touch, especially seeing as the upper of the two compartments is cooled. The storage box between the front seats are large, and the door pockets can accommodate 1.0-litre plastic bottles. The rear seat uses a 60/40 split "tip-up" design, with storage recesses beneath it. The automatic derivative of the flagship Hilux features more torque than its manual sibling. The new 2.8-litre 4 cylinder engine underneath the Hilux's bonnet delivers a healthy 130 kW and strong 450 Nm of torque across a wide rev range; the peak of the latter figure is available from 1 600 to 2 400 rpm. That's a boost of more than 100 Nm of twist compared with the old 3.0 D-4D engine. On paper, these figures are similar to what is offered by the likes of the Ford 3.2-litre and Volkswagen 2.0-litre biturbodiesel. In reality, however, the claimed figures seem to be conservative. The Toyota feels markedly more eager on the road compared with the more powerful Ford Ranger, and the engine is both smoother and more eager to rev. You can also select Power mode, which sharpens up the Hilux's responses even further. Overall, it's an engine that is seriously hard to criticise, and one that is well matched with this new 6-speed automatic transmission (which also includes a Sport mode). Should you wish to prioritise fuel efficiency, there is an Eco mode. This dulls the responsive nature of the drivetrain, however. The upshot is good fuel economy. 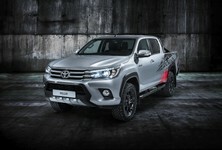 Toyota claims an average consumption figure of 8.5 L/100 km, which comfortably beats the Ford Ranger (9.0 L/100 km). In the real world, you're more likely to see figures of around 10 L/100 km for the Toyota, which is still markedly better than the 10.8 L/100 km we achieved during a test of the Ranger 3.2 XLT. For those of you interested in towing, this Hilux is rated to tow 3 500 kg (braked trailer). 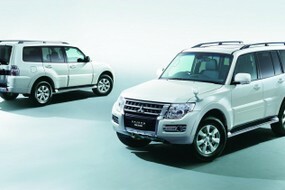 It features Trailer Sway Control as standard in addition to its stability control system. The Hilux remains arguably the best off-roader in the double-cab bakkie segment. A major area of focus for Toyota during development of the new model was ride comfort and general refinement. To that end, the new Hilux rides on an all-new platform that includes 30 mm thicker side rails and cross members to achieve a 20% improvement in torsional rigidity. This is an important development, seeing as a stiffer structure has great benefits for improved NVH (noise, vibration, harshness) control, safety and durability. Compared with its predecessor, which was often criticised for its relative bumpiness, the new model also boasts a longer leaf spring design that suppresses surface vibration, larger-diameter shock absorbers mounted in a lew location and greater rear-axle wheel articulation. The steering (hydraulically assisted) has been redeveloped to offer better steering feel. On the road, the improvements are immediately apparent. The Hilux rides smoother and quieter than its predecessor, with especially cabin quietness at higher speeds being impressive. 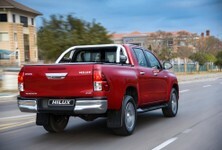 But while the improvements in ride comfort are clear, the Hilux remains one of the firmer-riding pick-ups on the market. This means that on poorer surfaces it is still bouncier than most of its rivals, including the Ranger and Amarok. Of course, like all bakkies, a load on the back improves matters. Hilux is better than ever in the rough... and automatic transmission makes accessing its capabilities far easier. And off-road? 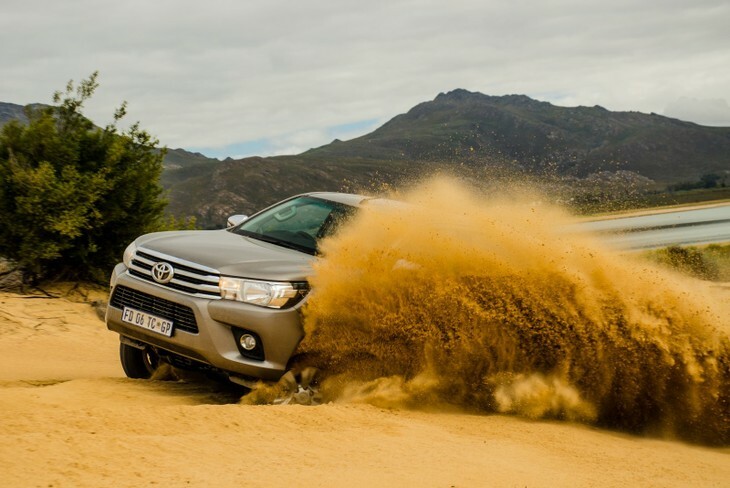 As we found in our in-depth comparative test at the Klipbokkop reserve earlier this year, the Hilux remains arguably the best in its class when the going gets rough. It offers very good ground clearance and that awkward-looking nose actually benefits the angle of approach, while the wheelbase (which hasn't grown) obviously benefits the breakover angle. You can now use the rotary knob to switch to four-wheel drive (4H) at speeds of up to 50 kph, and there's a rear diff-lock to further assist in sticky situations, in addition to limited-slip differentials (LSD) in both axles. The extensive rear wheel articulation further helps maintain traction and you also get downhill-assist and hill-assist control. Now add the automatic transmission, and all the sweat has essentially been taken out of off-roading. The Hilux is staggeringly capable, even in the hands of relative novices. The Toyota Hilux 2.8GD-6 Double Cab 4x4 Raider Automatic sells for R570 600 (at the time of writing, August 2016) and comes backed with a 3-year/100 000 km warranty and 5-year/90 000 km service plan. It requires servicing every 10 000 km. While most people would point to the Ford Ranger 3.2 XLT and Wildtrak derivatives as this Hilux's deadliest rivals, it's not that simple. The sales figures suggest that a surprisingly strong contender is Volkswagen's Amarok Highline 4Motion, which is equipped with a slick 8-speed automatic. 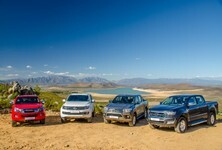 This trio of vehicles (Ranger, Hilux and Amarok), deliver the bulk of sales in this segment of the market. This also appears to suggest that there isn't a dominant vehicle among these 3 that is markedly better at everything than the others. In our experience, that rings very true. The Hilux's drivetrain refinement and cabin design/finish is now arguably class leading. Yet, the Ford offers a better ride quality over a wider variety of road surfaces, as well as the most cabin space. And the Amarok is the one to get if a car-like drive is a high priority. You know where your priorities lie. That said, even those shoppers with no preference for the Toyota brand will be impressed with this new Hilux's blend of refinement, quality finishes, power, efficiency and off-road ability. View this video to get up to speed on the new Hilux's major improvements. Interested in buying a new/used Toyota Hilux?